Run mode allows you to test the operator toolbar within the Toolbar Editor. Blink, tooltip and enable data bindings are active. Mouse gestures run operator actions. Key up or key down events also run operator actions. In run mode you can view, and optionally change, global variables defined in the global bindings. Right click on the toolbar. 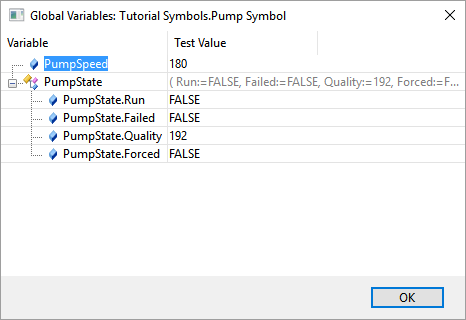 Select Global Variables to open the Global Variable Editor. Click on BOOL values to toggle between TRUE and FALSE. Click on other values to start an in place text editor. Enter a new value then press Return to confirm the new value.